Conventional treatment for head lice usually involves the application of a pediculicide, which is an insecticide specially formulated to control lice on humans. These insecticides usually are formulated into shampoos, lotions, or gels that are applied to the patient's head. Pediculicides are designed not only to kill the adult and nymphal lice, but also to soften the cement holding the nits to the hairs so they can be combed away using a fine-toothed comb that typically is included with the pediculicide shampoo or lotion. Most over-the-counter pediculicides contain either synergized pyrethrins or permethrin. Unfortunately, many lice have become resistant to one or both of these ingredients. Prescription pediculicides containing lindane or other ingredients are available from your physician, but are reserved for use when less-toxic products have been used unsuccessfully several times. A good place to start when choosing a lice-control product is with your physician or health care provider. 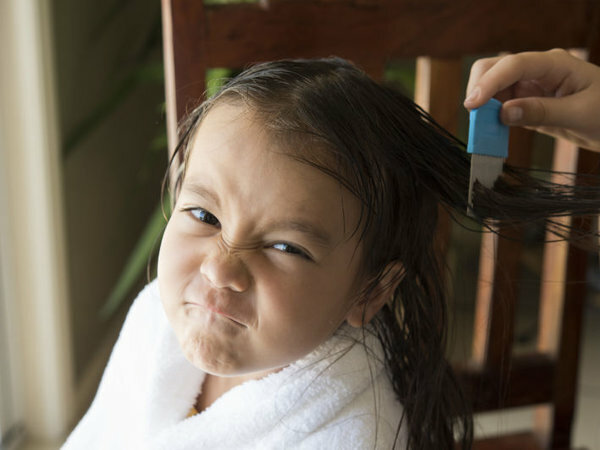 Chances are you (or your child) are not the only patients experiencing a head lice problem. Your health care provider may have the inside scoop on what's working and what isn't. As with any pesticide, be sure to read, understand, and follow the label instructions for whatever product you and your health care provider decide to use. Be especially careful not to get pediculicide products into the eyes of the person being treated. Several years ago, when my two goddaughters were living with the old lady and me for a while, there was a near-epidemic of insecticide-resistant head lice going around in the New York City neighborhood where we then lived. We lost track of how many times we treated the girls with conventional head lice shampoos, only for them to become reinfested a few days later. Had they been boys, we would have shaved their heads bald and been done with it. That's the ultimate, sure-fire, non-chemical way to get rid of head lice. Just shave the kid's head. Problem solved. But little girls tend to object to getting their heads shaved. Go figure. What ultimately wound up working was a combination of three unconventional approaches to head lice control. The first was an electric head lice zapper. The one we used was the Robi-Comb, but I imagine they all work pretty much the same way. You basically run the device very slowly and methodically through the patient's dry hair. When you hit a louse or a nit, they get electrocuted. The louse or nit, that is, not the patient. I have to admit that because most of the electric lice zappers didn't get very good reviews, I was skeptical about ordering one. But nothing else seemed to be working; and we didn't want to use lindane, which was the only thing we hadn't tried. So we figured we'd give the zapper a shot. It worked great for us. I think part of the problem some people have with the zappers may be that the batteries really don't last all that long. I noticed that on a fresh battery, there was a faint but noticeable "Bzzzt" when the comb hit a louse or nit. But that "Bzzzt" barely lasted through one head of little girl hair. So I bought a supply of alkaline batteries and changed the battery between every head. The other part of the problem might be that because children tend to be impatient, the adults treating them tend to get rushed through the job. With a fresh battery, however, the girls themselves could feel when the comb hit a louse or nit; and as frustrated as they were with the lice and the failure of any other methods we'd tried to kill them, they found that "Bzzzt" quite satisfying. It became kind of a mildly sadistic game for them. The second stage of the treatment was washing the girls' hair with a natural, plant-derived head lice shampoo called LiceLogic, followed by a thorough combing with a metal head louse comb (not the electric one!) while their hair was still wet. Thoroughness is key here. I'm sure the mint in the LiceLogic has some insecticidal efficacy, but the real benefit of this shampoo seems to be that it does a great job loosening the cement so any nits who survived the electric attack could be combed out. We then had them shower and wash their hair again just to be extra sure any lice and nits were gone. The final salvo in our attack was spraying the kids' hair with an herbal head lice repellent any time they went to school (or anywhere else). We also sprayed it on the hoods and collars of their jackets and on their woolen hats. These products don't kill head lice, but they do make it less likely that the person will get reinfested. They do this by repelling "new" head lice, not by killing existing ones. We used several different brands with various flowery and minty aromas. They all seemed to work, and I don't recall any of them working better than the rest. The long and short of it is that when conventional head lice solutions didn't work for us, a multi-pronged alternative approach did. Your mileage may vary. Head lice can sometimes live a few days once after they have fallen, crawled, or been shaken out of a person's, which can result in a treated person (or other members of the family) being re-infested by lice who crawl back into their hair from furnishings or clothing. In most cases, a thorough vacuuming and shampooing of furnishings (especially upholstered chairs, carpeting, sofas, mattresses, and bedding), as well as washing or dry-cleaning of all clothing and bed linens, will remove displaced lice and prevent re-infestation. In cases where shampooing of furniture is not practical (or when lice continue to re-infest the people in the house, even after proper treatment), you can use an insecticide labeled for lice to treat bedding, furnishings and carpeting (not people!). Most aerosol head lice sprays use natural or synthetic pyrethrins or other botanical ingredients as their active ingredients. Some of these products may cause allergic reactions in people with plant allergies or hay fever, even when applied only to furnishings; so be sure to read and follow the label directions carefully. Some organic cleaning supplies, such as Kleen Free Naturally, also have some insecticidal activity and may be better options for treating head lice in structures and furnishings. For more information about lice and their treatment, I suggest you visit the CDC Head Lice Page. They have excellent and current information about both conventional and alternative treatment methods, as well as a great deal of information about head lice in general.